What do you do when it’s almost, but not quite, a snow day? That’s a snow-brainer: you take the classroom outside and embrace the season! That’s what Christopher Bailey, teacher at Onondaga-Brant Public School, and his students decided to do on a recent wintry day. Seizing the opportunity to work with the weather conditions, the class applied the arts curriculum and decided to use snow as a material for an artistic project. During middle block on the first day back following the break, Bailey consulted with the Grade 8 class about the weather, and together they developed an innovative group project around it. Then they bundled up and went outside. Grand Erie’s Multi-Year Plan includes Environment as a key pillar, and recognizes that innovation includes creating spaces to reflect current teaching and learning needs, encouraging the best use of spaces both in and outside the classroom setting. Using the school grounds, students mapped out an area and developed a plan to construct an elaborate snow castle. They used skills from a variety of subjects to work together to realize the project. The result was part fine-art sculpture, part functional structure, which had an imposing look on the field – just as a snow castle should. Everyone worked hard to construct the castle, with the Grade 7 and 8 classes even continuing the work during recess to put the finishing touches on it. 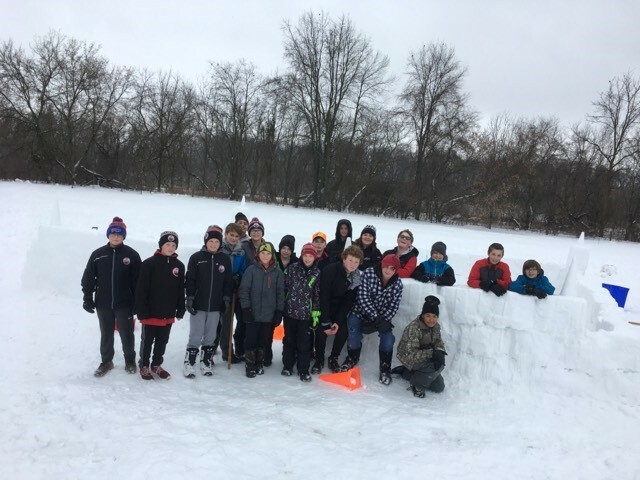 Snow doubt about it, Onondaga-Brant Public School is making the most of winter.